The 11 protesters who were cited for trespassing at the Old North Carolina State Capitol, and the NC-NAACP's Rev. William Barber (back center), gave speeches on the building's doorstep after they were released. Eleven protesters who said they wanted to personally ask Gov. Pat McCrory to overturn Republican government policies received trespassing citations for refusing to leave the Old North Carolina State Capitol building after it closed on Monday afternoon. The 11 protesters who gathered in the state’s historic Capitol Building were part of a bigger group -- the continuing Moral Monday movement. They couldn’t find the governor right away, so they read an open letter in the building’s rotunda. They say they want the reversal of Republican state government policies on Medicaid and fracking. 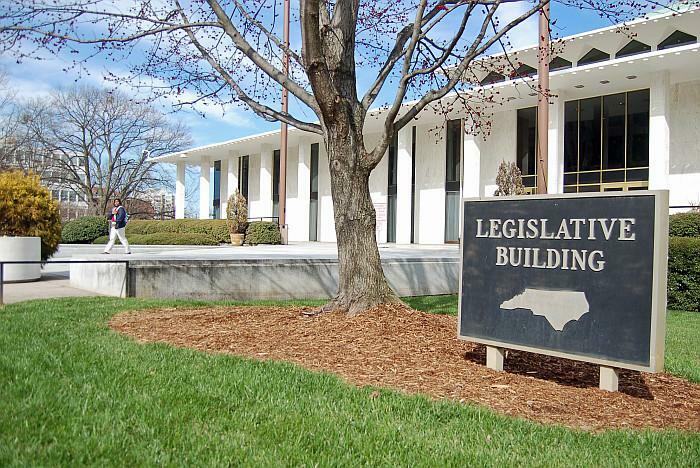 "We as North Carolinians want to protect our lives, our livelihoods, and the beautiful vistas that keep people visiting and residing safely in our state," read Jodi Lasseter , one of the 11. Lasseter and other protesters object to a bill the General Assembly sent the governor last week. It would allow the state to issue permits for fracking as early as next spring. This is the controversial form of shale gas extraction that has been linked to environmental and public health issues. Republican lawmakers say the industry will bring jobs and unprecedented investment to the state. At one point, they chanted: "McCrory do you hear?! McCrory do you hear us?!" Onlookers and reporters left when police told them it was 5 p.m. and the building was closed. The 11 protesters stayed. And an hour-and-a-half later they emerged from the building to cheers from hundreds of more protesters. They said officers were polite and gave them the option to leave voluntarily and when they didn’t, they handed them citations for second-degree trespassing. Soon, people were marching around the building singing: "This is the battle of Jericho and the walls come tumbling down"
No protesters actually saw the governor, but hymns were sung, speeches were given and an announcement was made. They’ll return to the Capitol next week, and their focus will be public schools. State lawmakers have less than six weeks to construct and pass a budget before the beginning of the next fiscal year. The Senate released its spending plan last night, providing raises for teachers in return for sacrificing tenure. The General Assembly is also considering an overhaul to the tax code. 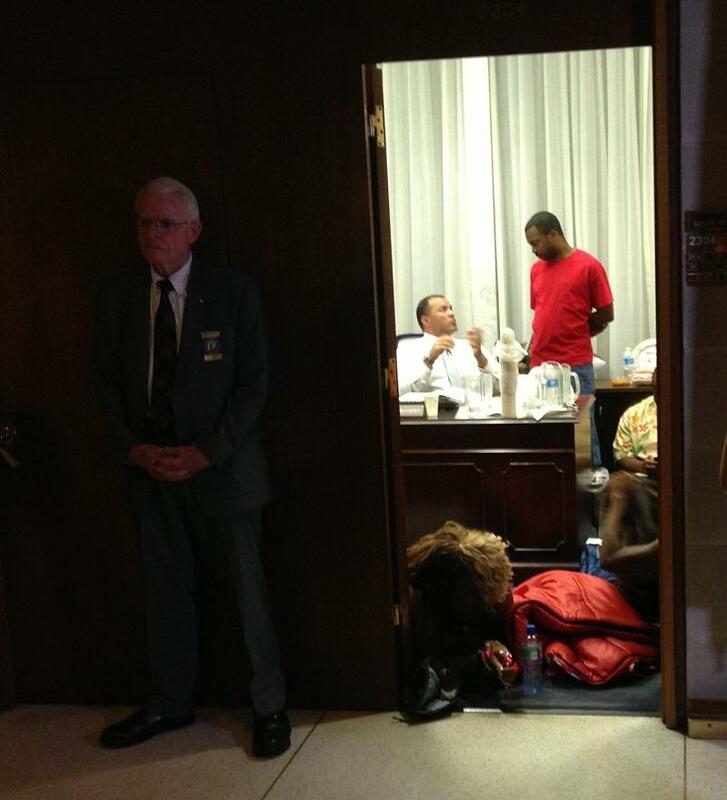 Meanwhile, 14 protesters from the Moral Monday movement were arrested after an overnight sit-in. Host Frank Stasio talks with WUNC Capitol Bureau Chief Jessica Jones about the latest from the legislature. Fourteen people were arrested overnight at the General Assembly after sitting in and demanding to speak with House Speaker Thom Tillis. They were there lobbying for more than 10 hours with organizers of the Moral Monday protests.